57,5 x 65,4 cm - 22 5/8 x 25 3/4 in. Henri Lerolle, Paris - Hector Brame, Paris - César de Hauke, New York - Jacques Seligmann, New York - Leonard C. Hanna, Jr. - Cleveland Museum of Art, 1997 (Don Leonard C. Hanna). 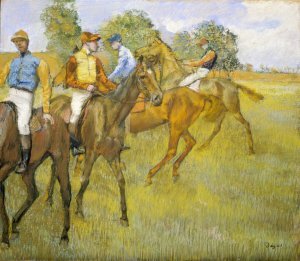 Cleveland Museum of Art, 13 mai-13 juillet 2003, Object in Focus : Degas' Jockeys - Cleveland Museum of Art, 15 février-16 mai 2004, Time Stands Still: Muybridge and the instantaneous Photography Movement - Cleveland Museum of Art, 21 octobre 2007-13 janvier 2008, Modern Masters from the Cleveland Museum of Art - Cleveland Museum of Art, 9 mars- 8 juin 2014, Treasures on Paper from the Collection of the Cleveland Museum of Art - Cleveland Museum of Art, 19 novembre 2016-19 mars 2017, Pure Color. Pastels from the Cleveland Musum of Art. Hourticq, Art et Décoration, XXXII, 1912, p. 111 (repr.) - Lafond, 1918-1919, I, p. 126 (repr.) - Hertz, Degas, 1920, pl. VI - Lemoisne, 1946-1949, III, n° 755, repr. p. 429 - Werner, 1977, n° 21, repr. p. 61 - Paris, Ottawa, New York, 1988-1989, fig. 320, repr. p. 565 - Washington, National Gallery, 1998, fig. 78, repr. p. 140.